Just as high school science is more complex than it is at lower grade levels, so are the safety issues you face in your classes and labs. 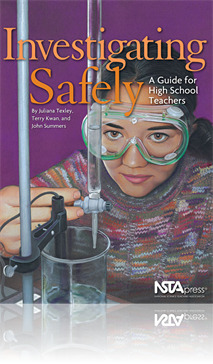 Reduce the risks to people and place with Investigating Safely, the third and most advanced and detailed volume in NSTA’s unique series of safety guidebooks for science teachers. Some of the guide’s 11 chapters deal with the special safety requirements of specific disciplines—physics, chemistry, Earth and space sciences, and biology. Others cover topics every high school teacher must grapple with, including equipping labs; storing and disposing of chemicals and other hazardous materials; maintaining documentation; and organizing field trips. You’ll learn not only how to accommodate students with special needs but also how to make every student a partner in safer science. Classroom veterans themselves, the authors have organized the book with practicality in mind. Safety concepts are discussed in the context of common situations in real classrooms. Sidebars and inserts in every chapter highlight and reinforce important material. Key information is selectively repeated in different chapters so you won’t have to flip back and forth. And permission slips, student contracts, and other sample forms are included for adapting to your needs. With scrutiny of teachers’ practices and concerns about liability accelerating, Investigating Safely belongs on the bookshelf of every high school science teacher—and every science supervisor.